FIXYOURTHINKING.COM / Need a brain? Borrow mine! : How Much Is This Blog Worth? Interesting that Daring Fireball is worth more than iLounge and iLounge gets 10X the hits. This should show everyone how much power John Gruber has in our little niche. Look at the small numbers from iLounge vs iProng. Roget ... I did that one for you ... thought you'd enjoy that. * From what I've been reading ... this is a good measure of what each site can expect to pull in in revenue each year by taking 10% of this total. For me - it's really close as it looks like I'm on track to get $1400 from this blog through ad revenue, book publishing, and paid aggregation of some of my stories here. Wow! Some of those blogs make me feel sooooo.... poor in comparison! I forget which blog, but I remember seeing one that was worth 13 million! What really depresses me is the map widget that shows where and how many people are logging onto your blog. Your map looks like a big city and mine, lol, more like that of a small village... population 3 or 4! Oh well, for a guy who doesn't have a clue what I'm going to write about next, and a guy who literally writes a post in five minutes or less, in a rush to get out the door, I guess I should be thankful my blog isn't less then it is. Enjoy your blog immensely. Keep writing and I promise I will keep reading! 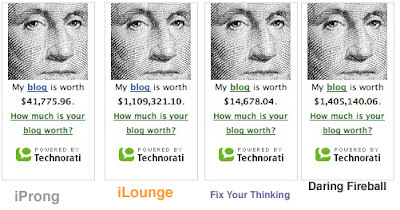 My blog is worth zero. I guess if I had a blog it might be worth a bit more. My old site is worth $6,774. My new one $0. I guess the longer it goes without new posts, the more the old site's worth.